""I found the photos of my two cousins...Strangely you put them next to each other...Nader Jahanbani and Vali-Mohammad Zand. My eyes are filled with tears. 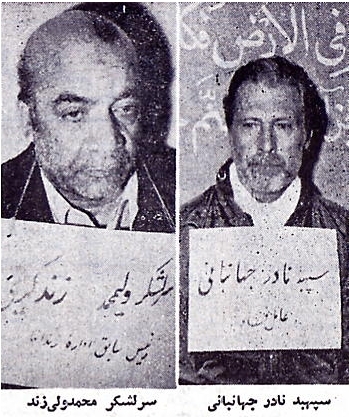 They were executed on the morning of Chaharshanbeh Soori of 1979. I'll never forget coming home from school (I was in the 12th grade that year) really looking forward to the party we were having that night...When I was told that both Nader (who also taught me horse riding at Farahabad) was executed and Vali Khan...I screamed and wailed and ran to the komiteh at Kaakh-e Javaanaan which was by our house and screamed bloody murderers at the B.... komiteyeh members. They stood there laughing at me calling me a spoiled whore. I'm proud of these two men. They were THE most decent men I knew. Vali Khan was a very momen (religious) person in fact. Those B... apologized to us afterwards when they realized that they killed HIM for nothing!!! One of his 4 daughters, was 8 1/2 months pregnant. She was a dentist and was driving to work that morning when she heard the news on the radio. 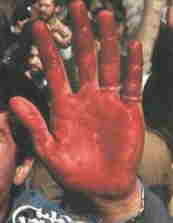 Vali Khan had in fact went in and introduced himself because he had done nothing, he was innocent. All he did was stayed loyal to the army. Because they (Islamite) were collecting all the military people he felt that he should do the right thing ...The next thing we know, was that they executed him!!!!!!!!!""